Whether or not you've always been a reader, chances are good that you've got at least a few favorite books from childhood. But if you were a total bookworm as a kid? A few probably doesn't even begin to cover it! There's something so significant about the books that impact you as a kid and stay with you through adulthood. For me, that's been the case with The Little House series by Laura Ingalls Wilder. I started talking about the series one day with Alexa from Alexa Loves Books - enjoying the walk down memory lane and our shared love and respect for these books. While we both considered it a childhood favorite, it had been years since either one of us had re-read it. And since I'm co-hosting The Re-Read Challenge this year, it seemed like the perfect motivation and opportunity to revisit this beloved series. So, Looking Back at Little House was born! During the next few days, we'll share our thoughts on the books after re-reading, some of our favorite moments and what to read after you're done. But today, it's all about our memories! There are a few series that will always be linked to my childhood memories, and this is one of them. As a kid, I was obsessed with historical fiction. I still love it today, but nothing compares to my all-consuming love for this genre when I was growing up. I wanted to learn everything I possibly could about the past, and these books were a huge milestone on that journey. I can't even remember how I discovered them, though I suspect it was either in school or from my mother, but I was hooked from the first page! I loved the Ingalls family and the way they loved each other. I adored looking at the detailed illustrations and seeing my favorite moments depicted. Of course, my favorite aspect was the history! I learned so much about this time period, and it's one reason I think I've always been drawn to American history. When I was in third grade, my class read a book about Laura Ingalls Wilder. Once we finished, we got to celebrate by dressing up like pioneers. I WAS ALL OVER THAT BUSINESS (as you can see in the photo on the right). And then there was sixth grade... I can't remember all the details of the project, but I know we chose a partner and had to build something based on a book. My friend and I ended up building (with a lot of help from her dad) the Little House cabin. IT WAS AMAZING! I was a little too old to play with dollhouses at that point in time, but I totally wanted to keep it forever. What did I remember about the series before our re-read? Not much, I'll admit! Pa, Ma, Mary, Laura and Carrie loomed large in my mind, though I completely forgot Grace. I remembered the cabin in the woods and the sod home by Plum Creek, but none of the many other places they lived. I vaguely recalled them traveling by covered wagon and the long winter without food. As far as the plot, the only things that stood out were Mary going blind and Laura marrying Almanzo. Like Alexa, I just saw the big picture without many details. 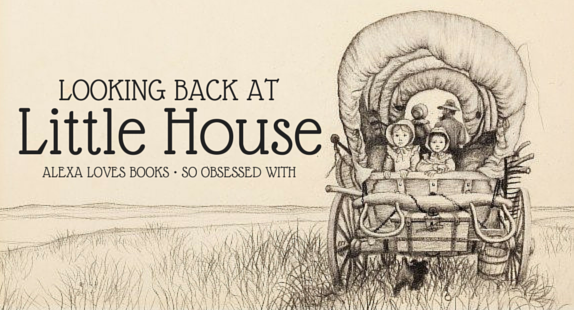 Did you read the Little House series as a kid? Have you revisited any of the books as an adult? THAT PHOTO. It's amazing and you and Alexa are amazing and I am THRILLED you two are doing this! Like you, I only remember the big picture and I'm starting to realize that's how a lot of my childhood favorites have become ingrained in my mind. A few months ago I reread Charlie and the Chocolate Factory and while I obviously remembered most of it (largely due to being OBSESSED with the movie - Gene Wilder's not the remake tyvm!) I was surprised by the little details. Charlie's father is alive and well and working in a toothpaste factory, for example. Last year I read Pioneer Girl, Bich Minh Nguyen's sort of-kind of modern retelling of Little House and then I reread it this year. Once again it rekindled my desire to read the Little House series and since I have yet to do so, I'll be looking forward to your posts! You guys! This is so cute (esp that pic of you as a pioneer - you took to this LIKE A BOSS) - I can't wait to hear your reactions! I seriously LOVE that you dressed up like a pioneer! Also, I'm so happy that we share a love for the Little House series. It was such a defining set of reads for my childhood, and I'll always look back at them with great fondness. So glad we teamed up to have this little celebration! The Little House series is still one of my all time favorites because of how much I loved it as a kid. I should really re-read them too. I haven't in years. I'm actually re-reading Harry Potter for the first time in years right now because I'd decided it had been too long, and I've been thinking since starting that that there are some other books I need to re-read too. Little House has been the top one in my mind, and I think I'm going to do it once I get through Harry Potter. I read this series the first time in 3rd and remember that several other girls in my class were all reading it as well. As you know I reread it this past January when I was on maternity leave, but also distinctly remember rereading it in both middle school in college if not more. I do still enjoy it now, although I do think it read a bit differently. I thing that I thought about was how Pa and Ma were younger than I am now and how hard their lives must have actually been.